haha..tell that to othe rpeople. all these child starts keep saying this and the upcoming ones (miley,willow,etc) never hear until they get into that stage of depression. 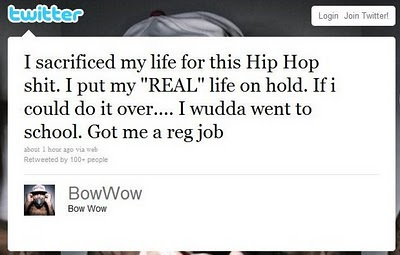 Bow Wow has no money so he wants school and a regular job...gimme a regular job and school life anyday....now that's where the fun starts and ends! That particular tweet didn't say anything about dieing. 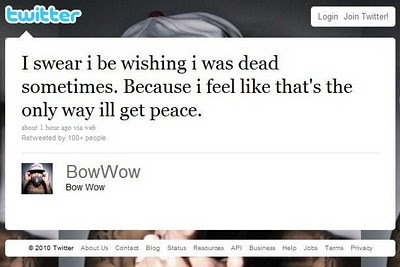 Ignore my first comment...didn't read the rest of his tweets. welcome to life dude....your time is over. go get a cleaning job or something.........anything to pay the bills. 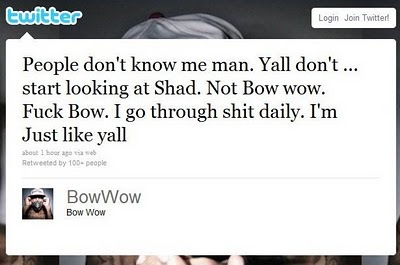 bow wow has no money???? do u guys think he made chicken pea... ppl dude is not broke and even if he were to blow all he has rite now it would take years.... he is not making anything music worthy now not that he is broke... its just like when they said michael jackson was broke... i mean ppl it is not one million naira o! Well his PR stunt didn't work this time he lost over 300,000 plus Twitter followers from over 700,000 with this BS. Now he can kill himself. 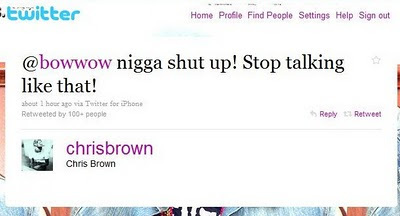 Plus he just did an interview with a blog and said he didn't mean it and it backfired on him. What is stopping him from going to school or even dying like he claims. He just likes attention.